He will never see this one coming … from five yards away, straight in front of him, on a flat stretch of dirt. Update: no, that is not using stealth. You can Ambush from stealth, but there is no induction timer in that case. She just walked up to the guy, crouched down with a javelin for five seconds, and planted it in his forehead. I just tried to remember any MMO or just game where stealth is not gross or taking over the whole game (Thief, Splinter Cell). Cannot wait for GW2 to come out, I’m hoping this kind of faux-stealth will be targetted as a problem. I’ve always loved playing “ranger/rogue” type characters, but the number generated stealth systems are just a little bit anti-immersive. I’d like one based on hiding in shadows, using cover and moving when the opponents back is turned. Of course, thats difficult to do with a 3rd person view and a minimap at your disposal. She was not using stealth. She was Ambushing in plain sight. My bad! I’m not actually familiar with which game this is! I was just using it as a chance to rant out some of my gaming anger! @Longasc: I think EVE handles stealth (cloaking) reasonably well, while it is active you have a few restrictions and gain a few benefits. 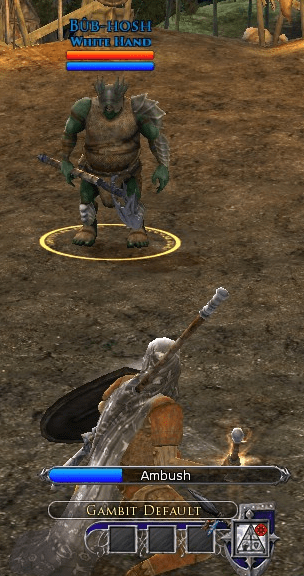 @Distilled: The game pictured is LoTRO, and to be fair every MMO has an aggro bubble quirks. Not sure why you find this particular example more ridiculous then lets say… fighting another enemy right in front of a mob, but just outside its aggro radius. So instead of building a skill for 5s you could have an all out 30s noisy fight, that draws no response. That’s better? GW even draws the boundary for you on the minimap. Or is GW2 doing away with the aggro radius and your mere presence will attract all enemies in line of sight? You can’t see too good through those orc helms. Hay listen! I’m hiding nao! Wun! Two! Threeeeeeeeeeeeeeeee! Though I think the most ridiculous was LegendMUD where people were sneaking up and backstabbing other folks with the Gae-bolg. Of course everyone also had three hands, so they could carry a shield, an offhand and a weapon. Obviously, MMO characters have devolved since MUD days.